Within all of the breathtaking views that Scotland has to offer there are these incredible monuments that originate from the first settlers over 10,000 years ago. Today, they are most prevalent in Orkney and Shetland and can also be found in Dumfries & Galloway, Oban, Arran and Argyll. Particularly, the Ring of Brodgar in Orkney which is made up of 27 stones and the largest stone circle in mainland Scotland, the 12 Apostles near Dumfries. Each of these stones weighs 10 tonnes or more, making transporting these stones an undertaking, not for the faint hearted! Wouldn’t it be fantastic to find out why they did this? 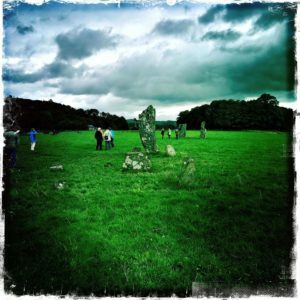 To give you a flavour and more of an understanding of what you can expect from visiting the standing stones, in this blog we will look at a few of the theories behind them. The importance of community would have been much more than it is today and you can imagine that even the building of standing stones, would have most likely have been a huge a celebratory social event and a great way to show off. They would have been a big draw for the numerous communities to meet, celebrate and fulfil their rituals. 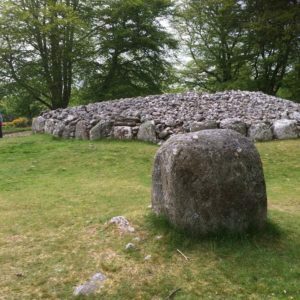 As no standing stone circle is the exactly the same as the other and their sheer size perhaps they were also a way of expressing the power and prestige of that community to others. Once the standing stones were built some 10,000 years ago, they would have played a crucial role in different rituals that represented the cyclical roles of life and death. Two examples of this are the standing stones Clach-na-Bhan and the Isle of Arran standing stones. The Clach-na-Bhan – Stone of the Woman, near Braemar, Aberdeenshire – was a standing stone circle that many women would journey to and sit on the stone that looks like an armchair as part of a ritual to increase the likelihood for an easy childbirth. Whereas the Machrie Moor, Isle of Arran standing stones, was used to cremate and bury prominent members of the community from a battle in 1314 in Stirling. Then there was the cyclical relationship between the sun and moon. 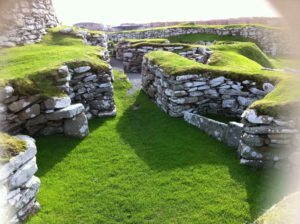 Two of the old stone circles – Callanish Stones on the Isle of Lewis and the Standing Stones of Stenness on the Isle of Orkney – are believed to have been built to better see the sun, moon and stars. Below is an image of the Callanish Stones, set out in a crucifix in a way to not only connect with the movements of the sun and moon but also in relation to the landscape around. This idea shows that the societies understood the cyclical natures of the sun and the moon, and were using them to understand the world around them. Even now, it is hard to go to these places and not feel connected to nature and we can imagine that this was even more so when these were built. Imagine how much deeper the connection would have been to the immediate surroundings without a device in your pocket that connects you to the rest of the world? There are varying ideas from archaeologists as to why they were made, but, ultimately, no one can ever be sure – and for us that makes it all the more exciting! We believe that the standing stones weren’t created for just one purpose but were multifaceted and key to each of the communities cultures. When you visit, we recommend that you try not to think too much about the labour or practicalities of why they are there as well. Instead to take in their vastness, soak it all in and envisage how they connected the community to each other and the world around them. If you are interested in seeing the Standing Stones in Scotland and learning about them in more detail, please get in touch with us to book a tour.